the little extras one would expect. 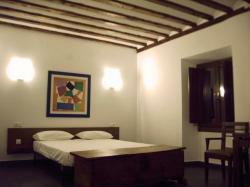 No hairdyrer..."
Palacio de Atienza Rural Hotel is located in a 16th century mansion in the historic town of Atienza. 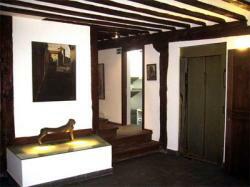 It is the only historic building restored maintaining the original style in order to hold a wonderful accommodation. 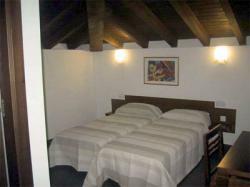 After careful restoration, it has 13 double rooms and 2 suites. 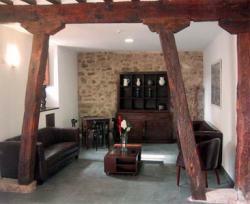 The restaurant is located in the old stables, overlooking the private garden next to the medieval wall. There are as well noble hall, cafeteria, TV room, pool, meeting room, etc. Atienza is an exellent medieval town placed in the north of Guadalajara which has its own castle and all the whole area is beautiful all year long. It is located at 31 km from Sigüenza, 60 km from Hayedo de Tejera Negra Natural Park and 85 km from Guadalajara. Once Atienza reached up into the city center along the right and you will see our signs. Reservation may be cancelled or amended up to 72 hours prior to day of arrival of the client. Failure to cancel your booking prior to this time will result in a charge of one night's accommodation apart from the initial guarantee deposit. On bank and public holidays and weekends reservation may be cancelled or amended up to 7 days prior to day of arrival of the client. In case of cancellation 30% of the total reservation will be charged apart from the initial guarantee deposit. In order to amend a reservation, please contact directly to the hotel which details figure in the voucher. If your amendment reduces the number of nights or rooms the deposit will not be refunded and will not be discounted of the modified reservation fee. "The lady owner was unfriendly, unhelpful and truly awful, she really couldn't 'be bothered' with anything. The fact that we were unable to attract their attention for dinner was appalling. We knew someone was about because their toddler was in the lounge watching tv. There is a bar in the hotel but was deserted so it was impossible to get a cold drink. The outdoor swimming pool was 'closed' and that was the only abrupt explanation we received. I do speak Spanish so it wasn't a language problem and goodness knows how one would get on if English had to be spoken as no attempt was made to utter one word."